Best Chinese Knives: How to spot a fake Zero Tolerance ZT0350 knife? How to spot a fake Zero Tolerance ZT0350 knife? Saw this question on one of the forums and decided to post an answer on the blog as well. Fake ZT0350s have appeared on the Chinese platforms a couple of months ago and sold for about ~$20. They come in 3 handle color options - Black, Orange and Jade (the natural color of G10). The finish on the blade and the pocket clip is blackwash (or acid stonewash, where the blade is first darkened by acid and later stonewashed). Overall length - 7 3/4" or 19.9 cm. Blade length - 3.25" or 8.25 mm. But the weight is different - 6.5 oz vs 6.2 oz on the original, that is probably because the liners aren't skeletonized in any way. The main difference is in the pivot mechanism. Genuine Zero Tolerance 0350 has a Speedsafe assisted opening mechanism and runs on washers. The fake on the other hand has steel bearings in the pivot and isn't assisted in any way. The back of the pivot has a hexagon shape (also prevents it from free spinning), while on the fake it's round. Another huge tell is the blade stopping method - on the genuine knife the blade is being stopped by the thumb studs hitting the liners, while the fake has an internal stop pin. The markings on the fake are made in white and serial number on the one I have is 7049 (will probably be the same on all of the knives). The marking on the clip is painted on the fake as opposed to engraved on the genuine. So, while it could be a bit different to tell the fake from a picture - if you get the knife in hand it will be much much easier to do. i...sort of want one of those fake jade ones. Acid etching usually won't darken a blade that much. 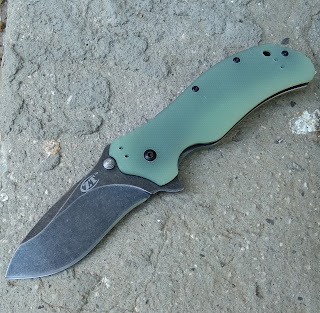 Once I stonewashed a black SRM 710 and then it had the same look as this blackwashed blade so I'd assume they paint a blade, maybe heat the lacque to burn it in and then tumble the blades. Got one of these in jade a few weeks ago and i love it. Came very sharp. Negative things is that the pivot pin needs some loctite or it will quickly loosen up and the blade will become offcentered. The liners are a bit sharp, especially noticeable on your thumb when closing it. But those are small problems and easily fixed. Overall a great knife for the price!